There was a time, in a more analog era, when the phrase “I laughed, I cried” was considered the highest of praise (especially if the work in question also happened to be better than Cats). But in an increasingly subdivided media landscape, one in which niche narrowcasting is the order of the day, networks are increasingly trying to make you do either one or the other. 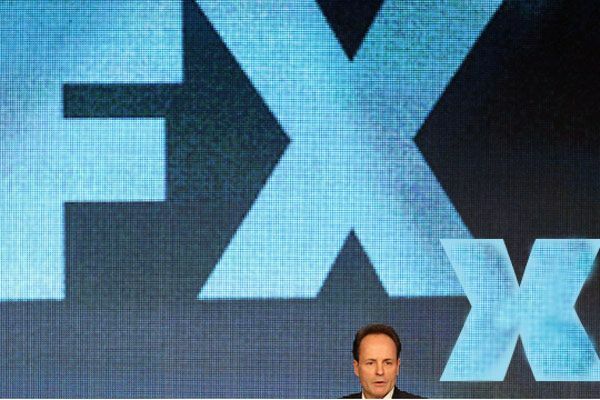 Late yesterday, news broke that FX was considering undergoing the television equivalent of a schizophrenic break and splitting itself into two distinct networks, each targeting a different sentiment. One, FX prime (or FX Classic, or Locutus of Borg), would continue to broadcast its signature envelope-pushing (and tongue-swallowing) dramas like Sons of Anarchy and Justified. The other, a new, comedy-and-youth-focused channel, potentially ready to launch this fall, would rather unimaginatively be called FXX. (I assume FX2 was taken out of consideration because Brian Dennhey’s quote was too high.) FXX would be built around FX’s existing stash box of successful, lowbrow (and lower budget) sitcoms like It’s Always Sunny in Philadelphia and The League, as well as the outrageous backlog of Hollywood movies the network has been gobbling up over the past two years like Garfield let loose at a lasagna factory. Dividing smiles from frowns has worked for broadcasters in the past: Turner has done well using a similar strategy to differentiate the formerly indistinguishable TBS and TNT, and AMC Networks is following that blueprint to a tee with its IFC and Sundance brands. But this move, should it come to pass, strikes me as business-savvy but human-stupid. John Landgraf, FX’s president, has done a remarkable job building a channel that has a clear identity on both sides of the storytelling ball: male-oriented and risky, which, I’m realizing as I type it, sounds exactly like the log line for the 1980 Al Pacino film Cruising. Splitting them now is a blow to the worthwhile if old-fashioned pleasures of discovery, the kind that only classic television scheduling could provide. This proposed emotional Maginot Line seems to limit the possibility that a lover of American Horror Story might take Wilfred for a walk, or that an Archer fan could investigate the upcoming (and excellent) The Americans. Under Landgraf, FX has admirably identified itself as a safe place for unclassifiable content, such as its biggest critical (if not commercial) success: Louie. Funny and sad, goofy and grim, Louie is wonderful precisely because it can’t be filed away under any limiting, preexisting label. Splitting comedy from drama is exactly the sort of thinking Louis C.K. rejects with every episode of his cracked labor of love. And it makes me worried for the creative future of television if such segregation is here to stay.